Instrumental Guitar-Driven CD consisting of a fusion of Rock, Blues, & Funk music with a beach vibe! Intelligent.....Adventurous.....Free Spirited....Honest........Inspirational and Electric are just a few words to describe the amazing and passionate style of Anthony Rufo's music. His profoundly understated and distinctive talents make his eclectic approach to writing and performing music a harmonic treat for audiences of all ages. Anthony is also an original hit talent down at the New Jersey Shore! 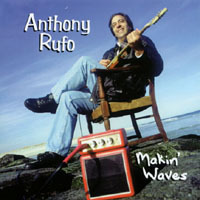 In his first CD, "Makin' Waves," Rufo showcases his keen ability and "heartfelt drive" to create moods, awaken emotions and paint pictures without the use of words. Using the guitar, piano, B-3 Hammond Organ, saxophone and a blend of rich and rockin' sound effects, Rufo tells his story by using a variety of musical styles. From new-age fusion to the red hot sounds of heavy metal, Rufo puts his heart and soul into every note he plays. The listener can almost "hear" Rufo's thoughts in the melodies he has created, whether playful, dark, inspirational, devotional or wild. From the intense vibrato in the song "Sanctifying Grace" or the ocean sounds in the devotional song "Kathryn", to the playful and soulful rhythms of "Bodhi Blues", Rufo's first CD, "Makin' Waves" is smokin', and a "must have" for any true music lovers' collection. "Above the Clouds", Rufo's second CD to be released this spring 2003, is another testimony to the talents of this versatile musician. Here Rufo will again expand his repertoire to include some vocals, while maintaining some of the instrumental flavor heard in the first CD. With beautiful vocals and harmonies fused on an "instrumental canvas" of rock, fusion, rap and heavy metal, Rufo's innate talent for lyrics will be highlighted, and address social, personal and political concerns. Whether screeching metal, island rhythms, inspirational accapello or tender love songs, Rufo sends his message loud and clear with every song he creates. Compared to the talents of Stevie Ray Vaughn, Eric Clapton and Joe Satriani combined with the poetic talents matching the likes of Bob Dylan, this second CD is Rufo at his best. His bold and original style combined with his lyrical convictions and "grass roots" wisdom is "over the top" and is guaranteed to magically send the listener "Above the Clouds!" FILLED WITH HOOKS AND MIND BLOWING LICKS, THIS CD ROCKS!!! IT'S FILLED WITH ANTHONY'S SINISTER SINGLE NOTE RIFFS AND CRUNCHING POWER CHORDS TO HIS TAPPING TRICKS, SQUEAKS AND OTHERWORLDLY GUITAR SCREEMS. HIS MASTERFULLY-CRAFTED MELODIES ON PIANO AND GUITAR WILL KEEP YOU COMING BACK FOR MORE!! Anthony Rufo's talents are amazing..A great addition to a musician's collection. A versatile and rockin' CD. There's something for everyone to enjoy here.A must have now purchase!!! !